Culture takes diverse forms across time and space. This diversity is embodied in the uniqueness and plurality of the identities of the groups and societies making up humankind. As a source of exchange, innovation and creativity, cultural diversity is as necessary for humankind as biodiversity is for nature. In this sense, it is the common heritage of humanity and should be recognized and affirmed for the benefit of present and future generations. In our increasingly diverse societies, it is essential to ensure harmonious interaction among people and groups with plural, varied and dynamic cultural identities as well as their willingness to live together. Policies for the inclusion and participation of all citizens are guarantees of social cohesion, the vitality of civil society and peace. Thus defined, cultural pluralism gives policy expression to the reality of cultural diversity. Indissociable from a democratic framework, cultural pluralism is conducive to cultural exchange and to the flourishing of creative capacities that sustain public life. Cultural diversity widens the range of options open to everyone; it is one of the roots of development, understood not simply in terms of economic growth, but also as a means to achieve a more satisfactory intellectual, emotional, moral and spiritual existence. The defence of cultural diversity is an ethical imperative, inseparable from respect for human dignity. It implies a commitment to human rights and fundamental freedoms, in particular the rights of persons belonging to minorities and those of indigenous peoples. No one may invoke cultural diversity to infringe upon human rights guaranteed by international law, nor to limit their scope. 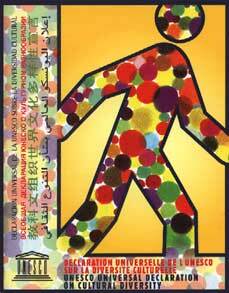 Cultural rights are an integral part of human rights, which are universal, indivisible and interdependent. The flourishing of creative diversity requires the full implementation of cultural rights as defined in Article 27 of the Universal Declaration of Human Rights and in Articles 13 and 15 of the International Covenant on Economic, Social and Cultural Rights. All persons have therefore the right to express themselves and to create and disseminate their work in the language of their choice, and particularly in their mother tongue; all persons are entitled to quality education and training that fully respect their cultural identity; and all persons have the right to participate in the cultural life of their choice and conduct their own cultural practices, subject to respect for human rights and fundamental freedoms. Creation draws on the roots of cultural tradition, but flourishes in contact with other cultures. For this reason, heritage in all its forms must be preserved, enhanced and handed on to future generations as a record of human experience and aspirations, so as to foster creativity in all its diversity and to inspire genuine dialogue among cultures. In the face of present-day economic and technological change, opening up vast prospects for creation and innovation, particular attention must be paid to the diversity of the supply of creative work, to due recognition of the rights of authors and artists and to the specificity of cultural goods and services which, as vectors of identity, values and meaning, must not be treated as mere commodities or consumer goods. While ensuring the free circulation of ideas and works, cultural policies must create conditions conducive to the production and dissemination of diversified cultural goods and services through cultural industries that have the means to assert themselves at the local and global level. It is for each State, with due regard to its international obligations, to define its cultural policy and to implement it through the means it considers fit, whether by operational support or appropriate regulations. In the face of current imbalances in flows and exchanges of cultural goods at the global level, it is necessary to reinforce international cooperation and solidarity aimed at enabling all countries, especially developing countries and countries in transition, to establish cultural industries that are viable and competitive at national and international level. Market forces alone cannot guarantee the preservation and promotion of cultural diversity, which is the key to sustainable human development. From this perspective, the pre-eminence of public policy, in partnership with the private sector and civil society, must be reaffirmed. (d) facilitate the implementation of the Action Plan, the main lines of which are appended to the present Declaration. (1) Including, in particular, the Florence Agreement of 1950 and its Nairobi Protocol of 1976, the Universal Copyright Convention of 1952, the Declaration of the Principles of International Cultural Cooperation of 1966, the Convention on the Means of Prohibiting and Preventing the Illicit Import, Export and Transfer of Ownership of Cultural Property of 1970, the Convention for the Protection of the World Cultural and Natural Heritage of 1972, the Declaration on Race and Racial Prejudice of 1978, the Recommendation concerning the Status of the Artist of 1980, and the Recommendation on the Safeguarding of Traditional Culture and Folklore of 1989. 1. Deepening the international debate on questions relating to cultural diversity, particularly in respect of its links with development and its impact on policy-making, at both national and international level; taking forward notably consideration of the advisability of an international legal instrument on cultural diversity. 2. Advancing in the definition of principles, standards and practices, on both the national and the international levels, as well as of awareness-raising modalities and patterns of cooperation, that are most conducive to the safeguarding and promotion of cultural diversity. 3. Fostering the exchange of knowledge and best practices in regard to cultural pluralism with a view to facilitating, in diversified societies, the inclusion and participation of persons and groups from varied cultural backgrounds. 4. Making further headway in understanding and clarifying the content of cultural rights as an integral part of human rights. 5. Safeguarding the linguistic heritage of humanity and giving support to expression, creation and dissemination in the greatest possible number of languages. 6. Encouraging linguistic diversity – while respecting the mother tongue – at all levels of education, wherever possible, and fostering the learning of several languages from the earliest age. 7. Promoting through education an awareness of the positive value of cultural diversity and improving to this end both curriculum design and teacher education. 8. Incorporating, where appropriate, traditional pedagogies into the education process with a view to preserving and making full use of culturally appropriate methods of communication and transmission of knowledge. 9. Encouraging “digital literacy” and ensuring greater mastery of the new information and communication technologies, which should be seen both as educational disciplines and as pedagogical tools capable of enhancing the effectiveness of educational services. 10. Promoting linguistic diversity in cyberspace and encouraging universal access through the global network to all information in the public domain. countries to the educational, cultural and scientific digital resources available worldwide. 12. Encouraging the production, safeguarding and dissemination of diversified contents in the media and global information networks and, to that end, promoting the role of public radio and television services in the development of audiovisual productions of good quality, in particular by fostering the establishment of cooperative mechanisms to facilitate their distribution. 13. Formulating policies and strategies for the preservation and enhancement of the cultural and natural heritage, notably the oral and intangible cultural heritage, and combating illicit traffic in cultural goods and services. of natural resources, and fostering synergies between modern science and local knowledge. 15. Fostering the mobility of creators, artists, researchers, scientists and intellectuals and the development of international research programmes and partnerships, while striving to preserve and enhance the creative capacity of developing countries and countries in transition. 16. Ensuring protection of copyright and related rights in the interest of the development of contemporary creativity and fair remuneration for creative work, whileat the same time upholding a public right of access to culture, in accordance with Article 27 of the Universal Declaration of Human Rights. 17. Assisting in the emergence or consolidation of cultural industries in the developing countries and countries in transition and, to this end, cooperating in the development of the necessary infrastructures and skills, fostering the emergence of viable local markets, and facilitating access for the cultural products of those countries to the global market and international distribution networks. 18. Developing cultural policies, including operational support arrangements and/or appropriate regulatory frameworks, designed to promote the principles enshrined in this Declaration, in accordance with the international obligations incumbent upon each State. 19. Involving the various sections of civil society closely in the framing of public policies aimed at safeguarding and promoting cultural diversity. 20. Recognizing and encouraging the contribution that the private sector can make to enhancing cultural diversity and facilitating, to that end, the establishment of forums for dialogue between the public sector and the private sector. 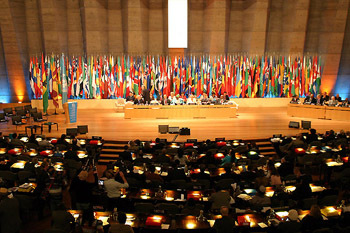 The Member States recommend that the Director- General take the objectives set forth in this Action Plan into account in the implementation of UNESCO’s programmes and communicate it to institutions of the United Nations system and to other intergovernmental and non-governmental organizations concerned with a view to enhancing the synergy of actions in favour of cultural diversity.